Lotto : There was no winner of this weeks lotto jackpot. The numbers drawn were 13. 16, 22 and 30. The €40 winners were Benny King, Carrickacleven; Tommy Brady, Arva; Brian Masterson, C/O The Well Bar; J.Tully, Caragh, Killeshandra; Karen Munnelly, Leitrim Village. Three Legged Race World Record Attempt : Well done to all the children who took part in the three legged race world record attempt in Cornafean on Saturday 4th May. The world record was smashed and an enjoyable race was had by all who took part. Thank you to all the juveniles for the fund raising effort and to everyone who helped out. interested in taking part are asked to attend a short meeting in the Sports Hall on Thursday 16thMay at 8pm. Contact Geraldine (087)1266980 or Marie on (087) 9435933. American Tea Party : A big thanks to all who supported the recent American Tea Party in making it a such a success. Arva/Cornafean Text Alert : If you would like to sign up to the text alert service please put your name and mobile telephone number on an envelope, together with €5.00 and leave it with Cormac O'Donnell, Arva Post Office or Art McSeain, McSeain's pub, Cornafean or contact one of the committee members. Lotto : The Lotto results from the 3rd March are as follows. The was no winner of the jackpot and the €40 winners were : Martin Smith, Cornafean; Mary McGibney, Corlis; Teresa McGibney, Dublin; The Brady Family, The Old Forge House; Geraldine Goldrick, Crossdoney. Community Alert : Arva/Cornafean Community Alert launched the text alert service for the area at a meeting in the hall on Wednesday night last. The meeing was well attended and a very interesting presentation was given by Crime Prevention Officer for Cavan/Monaghan. If you would like to sign up to the text alert service please put your name and mobile telephone number on an envelope, together with €5.00and leave it with Cormac O'Donnell, Arva Post Office or Art McSeain, McSeain's pub, Cornafean or contact one of the committee members. Children who were placed 1st and 2nd in their age groups, qualify to compete in the County Finals at Bailieborough Community School, on Saturday 9th March from 2 - 5pm. Lotto : There was no winner of this weeks Lotto jackpot. The numbers drawn were 7, 22, 24 and 27. The €40 winners were Carmel McDermott, Killeshandra; Maura Smith, TOTT; Noel Calders, Arva; Bernie King, Oghill,Ballinagh; Hugh Brady, Drumgoon. Whist: The next Cornafean whist drive takes place in McSeain's on Monday next 4th of March starting at 8.30pm sharp. New card players always welcome, with super served. Scόr Sinséar: Cornafean will be represented in two disciplines in the Ulster Semi Final on Saturday next 2nd March in Threemilehouse, Co Monaghan. Good luck to the Céilí Dancers of Noelle Fitzpatrick, Joanne O’Reilly, Laura Galligan, Lynn O’Reilly, Helen Cartwright, Eamon Gaffney, Ciaran Reilly and Niall Eames, and to the Tráth na gCéist team of Brian Doyle, Michael Dinneny and Tommy McGibney. All support appreciated. Whist: The next Cornafean whist drive takes place in McSeain's on Monday next 4th of February starting at 8.30pm sharp. New card players always welcome, with super served. The Gathering: ‘Come Back to Cornafean’ is taking place from June 21st to June 30th2013. There will be a meeting in the Leisure Centre on Thursday 30thJanuary at 9pm to discuss plans for this great event in our area. This will be open to all members of our community especially those who have ideas that might compliment the outline programme that has already been proposed. We are anxious that past members of the Cornafean Marching Band would attend and be willing to form a committee to help organise their special reunion. Trᾀth na gCéisteanna Uladh: Congratulations to Rita Martin, Tommy McGibney, Michael Dinneny and Brian Doyle who were worthy winners of the Ulster Final of this competition on Friday night last. Scόr Sinséar: Participants are busy practising for first round of senior scor which will be held on Saturday 9th February. We will have a full programme of disciplines. Hugh Brady : A word of thanks from Hugh Brady(Arva) to everyone who supported his sponsored walk in Slovakia in aid of Our Ladys Hospital For Sick Children Crumlin. Hugh would also like to thank the Anglo-Celt and Longford Leader for their constant support. The late Neil Phair: The untimely death of Neil Phair, Killeshandra at the relatively young age of 58 has cast a shadow of sorrow over the entire Parish. He had been ill for only a short period of time and passed away at his home on Thursday last. He ran Phair's pub in Killeshandra for a number of years until it closed and spent the last number of years working in many roles in Lakeland Dairies in Killeshandra before his illness. Sincere sympathy is extended to his wife Rita and Family, also Fr John and all his extended family. For Club and Country : This Hilarious play by Seamus O'Rourke takes place in the Breffni Arms Hotel on Friday 25th January in aid of St.Christopher's Hospice Cavan. Tickets are €10 and are available from Ciaran Weir, Martin Lyons The Village Foodstore Crossdoney or the Breffni Arms Hotel. A night not to be missed! Juvenile AGM : The juvenile AGM took place last Friday night. Liam Young was elected Chairman while Miranda McIntyre got the post of Secretary. Special word of thanks to both Seamus McGaheran and Rita Olwill for all their hard work over the last few years. Juvenile registration and training commences February 16that 10am. Also from January 1st 2013, all players playing Gaelic Football in grades up to and including Minor will be required to wear a mouthguard/gum shield in all games and practice sessions. Following the GAA’s Annual Congress in April 2012 a new rule was enacted that made it mandatory to use a mouthguard in all Gaelic football matches and training sessions from January 1st 2013 for all age grades up to and including minor and at U21 and Adult level from January 1st2014. Lotto : There was no winner of this weeks lotto jackpot. The numbers drawn were 4, 7, 8 and 26. The€40 winners were Padie McKiernan, Corr; Anna Corcoran, Corr; Karen Martin, Bruce; Gerard Doyle, Faranseer; Lily & Francie Duignan, Faranseer. GAA : Membership is now due . Please contact Padraig Gormley or any member of the committee. 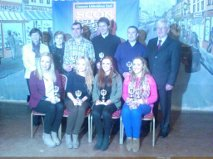 Scόr Encore is a new programme which starts on TG4 in February featuring various acts from Scόr na nόg county finals around the country. There was great excitement last week when the Cornafean ballad group received a call to say they had been successful at auditions and will now travel to RTE studios to take part in the recording of the first round shows. We wish Thomas, Ciaran, Shauna, Amy and Deirbhile and Geraldine their mentor all the very best of luck and look forward to seeing them on TV very soon. Scόr Sinsear: Practice is ongoing in all disciplines for Scόr Sinsear 2013. Cornafean will take part in first rounds on February 9th . Scor na nOg: Well done to our question time team of John Martin, James McGahern and Ciaran Cosgrove who represented our club and county so well in the Ulster Final on Saturday last in Derry. Unfortunately, they were unsuccessful in winning the title but put in a fantastic performance, leading up until the final round of questions. They can be justly proud of themselves for their performance on the night. Scor Sinsear: Practice is in full swing across all eight disciplines for Senior Scor which takes place weekend of 8th and 9th February. Whist: A special whist drive in aid of 'Palliative Care Cavan' takes place in McSeain's, Cornafean on Monday next 21st of January starting at 8.30pm sharp. Extra prizes on the night, new card players always welcome with supper served - please make a special effort to support. Juvenile AGM : The Juvenile AGM takes place on Friday 18th January at 9pm in the Sports Hall. Scor na nOg; Good luck to our question time team who compete in the Ulster Final in Derry City on Saturday next 12th January 2013 at 5pm. The team members are John Martin, James McGahern and Ciaran Cosgrove. 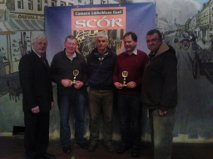 Scor Sinsear: First rounds of Senior Scor will be held on weekend of 8th and 9th February. Practice has commenced in most disciplines, however if you would like to take part please contact Marie 0879435933 before Friday 11th January. GAA : Good luck to Terence Reynolds and the Cornafean team for 2013 from the management and committee. Evelyn Agnew : Sympathy is extended to the Smith family of Farnadolly following the death of Evelyn Agnew(Smith) in Clontarf Dublin. May she rest in peace. For Club and Country : This Hilarious play by Seamus O’Rourke takes place in the Breffni Arms Hotel on Friday 25th January in aid of St.Christopher’s Hospice Cavan. Tickets available from Ciaran Weir or the Breffni Arms Hotel. A night not to be missed! Stars In Your Eyes The annual Stars In Your Eyes show presented by Cornafean GFC on the 3rd night of Christmas was another resounding success with the audience enjoying another mix of music song and fun from national and international acts. With acts as diverse as Bruno Marrs ,the laughing Policeman, Tom Jones and the Gangnam style dance the wide variety kept the audience and especially the young kids enthralled for the night. A big thank you to Caroline, Neal and Catherine for getting the show up and running again and Paddy Mc Dermott MC on the night. The live entertainment on the night was provided by singers Emma Cartwright, Shannon Laheen and the junior Ballad group which was very much appreciated. Word on the ground is the local lads who perfomed the gangnam style dance which won the audience vote on the night are busy with contract talks regarding a nationwide tour. Watch this space.